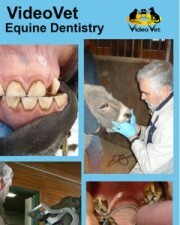 These DVD/CD combinations describe and illustrate how to perform a lameness evaluation in a lame horse. Examination of a horse at the walk, straight trot, and when circled is demonstrated together with all flexion tests of the forelimbs and hind limbs. Proper positioning for diagnostic flexion tests are described and demonstrated on the DVD. Examples of specific types of musculoskeletal abnormalities (upward fixation of the patella, stringhalt, peroneus tertius rupture, fibrotic myopathy, forelimb paddling, and hind limb plaiting) are demonstrated using clinical cases. In addition, 7 horses with forelimb lameness and 7 horses with hind limb lameness problems have been included to demonstrate what clinical parameters the author looks for when observing horses with forelimb vs. hind limb lameness.